Whispered wisdom passed down generations. As you enter the house, and keep your car keys on the counter, balancing your laptop bag on one shoulder and the groceries on the other, your thoughts are filled with arranging dinner and to-do lists. When your daughter runs up to you and asks for the car keys, you realise, with a slightly sinking feeling, she isn't going to be home for dinner. The phone rings, and you go about making plans for the next day. Schedules are made, itineraries confirmed, and your week lies ahead of you in a neat grid on top of your fridge. Until, a strange kind of feeling- a sudden loneliness, in the midst of company- strikes you and confuses you. You realise that you live alongside each other. As a family, you may have your weekend cookouts and movie nights. You do what the to-do list says. But, when was the last time you actually had a conversation with your daughter? Conversations about passion and career, the difference between men and boys, the balance of tradition and modernity, the fine line between equality and compromise. The wisdom that was whispered down generations, was instilled in you, without you realising. 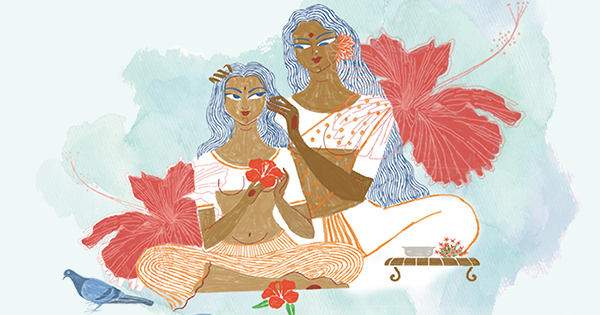 Through the form of stories, while warm coconut oil was smeared into your scalp. You struggle with a decision - you wonder if you want to be that kind of Mother, or can ever be? As she puts on lipstick and a pair of shoes you don’t remember buying her, you realise how much she’s grown. And a feeling of urgency helps you make your decision. ‘Don’t make any plans on Sunday,' you say, ignoring the grid on the fridge. ‘Let’s spend some quality time, you and I’. The easiest (and healthiest) hair growth tip to gorgeous locks!